(File) Lolong is seen here in a caged pen in the southern Philippine town of Bunawan on September 21, 2011. (CNN) -- "So long, Lolong." Environment Secretary Ramon Paje called it a significant loss to the country's crocodile conservation program, describing Lolong as an "ambassador," according to CNN affiliate ABS-CBN News. 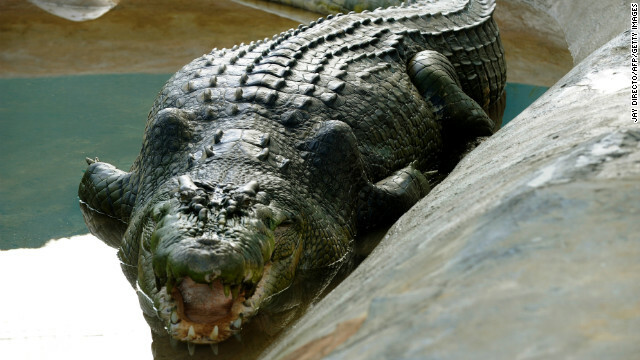 But the 1,075-kilo (2,370-pound) crocodile's legacy will live on, Paje said, since officials plan to preserve his capacious skin so that it can be stuffed and mounted. He was reportedly named after local hunter Ernesto "Lolong" Conate, who died of a stroke while helping plan the capture of the gargantuan creature. Elorde expressed support for the idea of preserving Lolong, so that villagers "can still see him."